JS Products Inc Master Terminal Tool Kit is designed with machine knurled aluminum handles for the new Volkswagen and Audi vehicles. This tool kit is designed for coolant sensors, wiring harnesses and terminal blocks on Chrysler, Hyundai, KIA, Mitsubishi imports. It helps to eliminate damage to wires or terminal blocks . 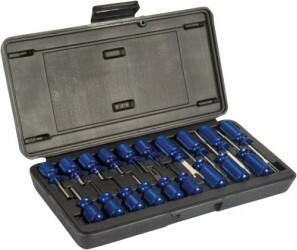 This tool kit features an application chart for reference that is included inside the storage case . This kit includes a variety of tools and blades.